My family and I had the best time sitting down to this dessert last Sunday afternoon. It started with a batch of homemade pistachio ice cream, then I made chocolate soufflé to go with it. Boy oh boy, was it a treat! I had a moment of pride bringing this to the table, feeling a little amazed I made it with my two little hands. A few years ago, I wouldn't have thought it possible to create so many restaurant dishes and desserts at home. But now, I know that many things that seem hard aren't so hard at all; it just takes a little planning and concentration. It actually started with the ice cream. Months ago, I was looking through this breakfast cookbook and among the recipes, I found one for pistachio ice cream. Like I've said before, pistachio desserts are always especially good for some reason! I love everything from pistachio cake to macarons, cookies, and biscotti, and a scoop of pistachio ice cream/gelato is always a treat when I can get my hands on it. So I was very interested in this relatively simple pistachio ice cream recipe I found myself looking at. Funny thing though...when I set out to make the ice cream, I looked up pistachio ice cream recipes online to do some comparison and found the exact same recipe on epicurious.com that's credited to a different source. It made me scratch my head a bit but I'll just leave that alone and say that as far as results go, I am very happy with this pistachio ice cream! It turned out full of pistachio flavor - with a little almond extract in the background that I think compliments it quite well. The pistachio flavor comes from grinding pistachios with some sugar and flavoring/cooking the milk with this mixture (which is later strained and discarded). Stirring some chopped pistachios into the ice cream adds texture and reinforces the pistachio flavor. This recipe leans closer to gelato given more milk than cream (2:1 ratio) in it, and I think it works really well in cases like this where you want the delicate nutty flavor to shine through. So basically, I can now have excellent pistachio ice cream/gelato at home anytime I feel like it! I was thinking a special ice cream/gelato flavor like pistachio needed to be used or showcased somehow. I noticed that the epicurious recipe, which is sourced to a restaurant that was once in PA, mentioned that the ice cream was served with warm chocolate soufflés. Well, it took me no time at all to decide to copy that idea! I made chocolate soufflés using a David Lebovitz recipe I've posted about in the past. All in all, the chocolate soufflé with the pistachio ice cream was just...fabulous. I made four of these and the three of us wiped the ramekins clean in no time at all. 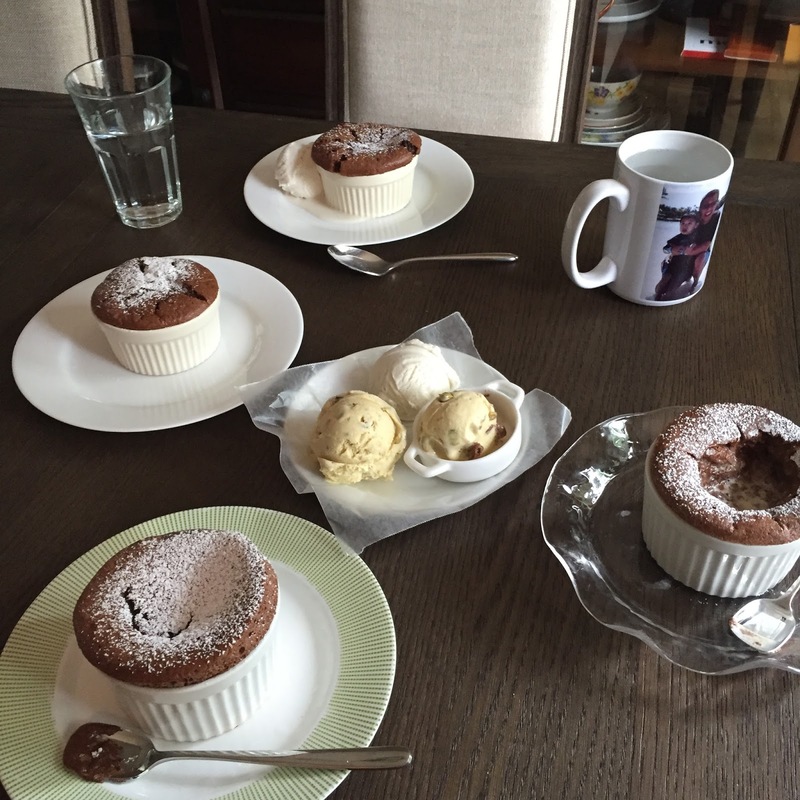 That's the thing with both soufflé and ice cream - they're meant to be devoured without hesitation. - I used shelled, roasted and unsalted pistachios for this recipe. Grind 3/4 cup of it with 1/4 cup of sugar. Then bring this mixture, along with 2 cups of milk, to a boil. - I stirred a scant 1/2 teaspoon of almond extract to the milk and pistachio mixture; some reviews for the recipe mentioned that 1/2 teaspoon was too much and distracted from the pistachio flavor. I noticed that the extract is added before the custard base is cooked (usually, you find that extracts are added to cold custard just before churning) and I figured this would mellow the extract flavor a bit. I was happy with the result of the scant 1/2 teaspoon. You notice the almond extract but it's not overbearing and I think it compliments the pistachio flavor and gives it a little boost. - When you strain the custard, make sure to press down into the nut mixture and squeeze out as much pistachio flavor as you can. - I added 2/3 cup (instead of 3/4 cup, which I thought a bit too much) of coarsely chopped unsalted pistachios to the ice cream. Instead of adding it before churning as the recipe states, I added the nuts in the very last minute of churning. - Lastly, I did not use any food coloring to the ice cream. A green spoon is good enough for me. As with all homemade ice cream/gelato, I like to let it sit in the freezer overnight after churning for the flavor to develop. Please see this post with more details about the recipe. They are surprisingly easy to make and I love the light, yet richness, of a chocolate soufflé. One thing I try to be mindful of is not over-whipping the egg whites. It's easy to turn away and do something else and find the whites over-whipped, in which case it starts to break and is too dry to incorporate. It ends up giving your soufflé little to no lift in the oven (I know this from experience!) so be careful and stop when you just reach a stiff, glossy peak. The sugar in the whites helps stabilize them and make it easier to reach this. I filled 4 ramekins and you'll have a different yield depending on what size container you use. These take about 12 minutes in a 400 degree oven; they should be puffed and jiggle slightly when gently moved. It's so exciting when it comes time to pull them out of the oven! As you can see, sometimes the top cracks, sometimes it doesn't. Don't sweat it! Pretty nifty to bring this dessert to the table! And that's how my family and I really sat down to dig into our treat after the quick photo op! My husband took a pic of the "aftermath", when there's nothing but dirty dishes left. I'll spare you that graphic but it was gone all too soon, as my husband says. That said, it was so very, very good while it lasted! I'm still on a soufflé high right now! I hope you're looking forward to Memorial Day weekend! Can you believe we're already looking at the unofficial start of summer! Butter four 6-ounce ramekins and coat each with a teaspoon or so of sugar, shaking out the excess. Set ramekins on top of a baking sheet. Preheat oven to 400 degrees. Melt chocolate, espresso powder, and milk in a bowl set over a pan of simmering water. Remove from the pan and whisk in 2 1/2 tablespoons of sugar, vanilla, and egg yolks. Set aside to cool. Place egg whites into bowl of stand mixer fitted with the whisk attachment. Whip on medium speed until the whites turn foamy. Add the remaining sugar gradually and whip until it just reaches stiff peaks. Gently fold the whites into the chocolate base using a rubber spatula. Fill the ramekins almost to the top. Smooth the tops and run your thumb around the ramekin (this is supposed to help the soufflé rise evenly). Bake immediately or you can leave the filled ramekins at room temperature for an hour or two until ready to bake. Bake for about 12 minutes or so. They are done when they are firm but still wiggle when moved. Serve right away, with pistachio ice cream (recipe below). Finely grind 1 cup of pistachios with 1/4 cup sugar in a food processor. Bring milk and the ground pistachio mixture to a boil in a large heavy saucepan. Remove from the heat and stir in the almond extract. Whisk egg yolks and remaining 1/2 cup sugar in a large heatproof bowl. Gradually whisk in a few ladle-fulls of the hot milk mixture to temper the egg yolks. Scrape the mixture back into the saucepan and cook, stirring constantly, over low heat until custard thickens and leaves a path on the back on a spoon when finger is drawn across. This should take about 10 minutes or so. Strain custard through a fine mesh strainer into a large bowl, pressing down to extract as much of the custard as possible (discard the pistachio solids). Chill until cold, at least 2 hours or overnight. Whisk in 1 cup of whipping cream. Churn custard in an ice cream maker, according to manufacturer's instructions. In the last minute or so of churning, add the coarsely chopped pistachios. Transfer to a container and freeze until firm (I prefer to freeze it overnight before serving to allow the flavor to develop). Great combination of flavours and your chocolate souflee looks fantastic! Good morning Monica, just the photos alone are good enough to entice me :) Love the chocolate souffle and pistachio ice cream.! I will certainly be making the souffle with store bought icecream in the near future. Glad to hear it! I often eat souffle plain and it's wonderful since that soft center is almost like it's own source. Otherwise, store-bought ice cream is surely a very smart way to go! wow ice cream with chocolate. its my favorite. in these day here is summer and very hot days. in hot days cold ice cream wow wow. i love it very much. I love the combo of pistachio and chocolate! Never thought to put them together before!! So good together, for sure! I'm now thinking about chocolate shortbread with studs of pistachios...I know I've seen it and wanted to make it but now this is bringing that back to mind. wow..decadent! Those chocolate souffles are simply perfect! Thank you! I'm happy I didn't over-whip the egg whites...it's hard not to sometimes! You should be so proud of that dish, Monica, the rise on the souffle is amazing! Oh here you go again Monica, another fabulous dish and you make everything sound so easy. Looks like something you would get at a five star restaurant. You are my hero! I have always wanted to make a souffle - you nailed it! LOVE, love love pistachio ice cream and your's is beautiful! Ha! That is a huge compliment and I feel so accomplished, Tricia! haha. I love pistachio ice cream too...it seems such a treat, doesn't it? This is a nice recipe and as for souffle - you would nail it but I know you'd want to do it justice. There are some recipes that starts with a pastry cream base and those seem to be more stable but I once tried a Grand Marnier one after eating it at a restaurant and trying to scale it down, etc. made it a mess. I got one "good" souffle out of it and it really made me appreciate the restaurant biz. Have a great holiday weekend ahead! Oh, I love your soufflés! 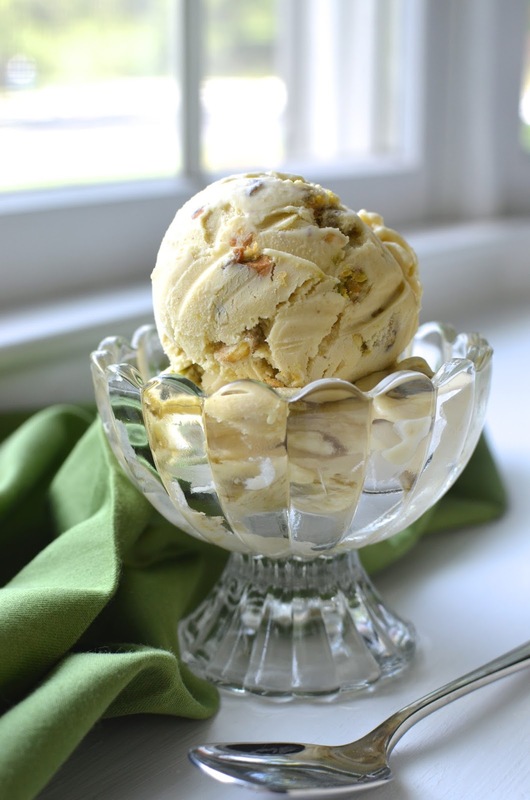 Look super delicious with pistachio ice cream! Thank you - it's definitely good with the pistachio ice cream! It looks really impressive! Pistachio ice used to be my grandmother's favorite ice. I could never understand it back then (I would only eat vanilla as a child), but I do understand her now. I have to get myself an ice maker. Adina - I totally understand. As a kid, it was always chocolate ice cream for me though I always loved nuts. : ) I am very happy I got an ice cream maker...there are so many flavors I want to make! Thank you! 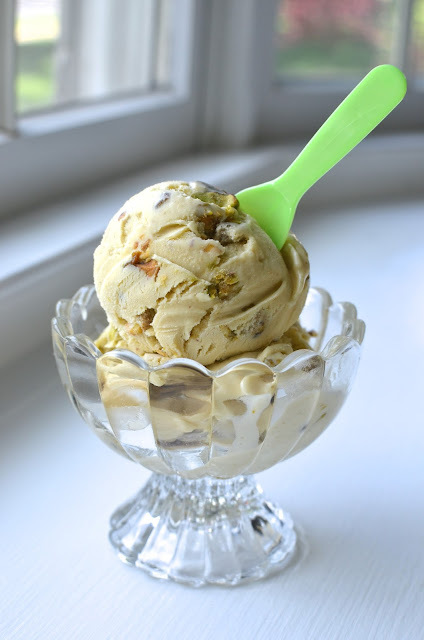 I have been meaning to make pistachio ice cream for the longest time now ... it's a huge favorite of both mine and the husband! And with those gorgeous chocolate souffles?? This is a perfect treat! Oh, I hope you make a batch. I have lots of ice cream flavors I hope to try one day. This pistachio was a treat! And a souffle always seem so darn special, doesn't it. It was a great treat for sure. Hope you have a great Memorial Day weekend coming up! I can have my souffle straight up but an excuse to make some and have it with ice cream is too hard to resist! Have a great Memorial Day weekend. Hope you have some time to relax! This soufflé looks perfectly crafted, Monica. And that pistachio ice-cream is speaking to me. I bet the pairing was divine. I will pair my chocolate soufflé with some ice-cream next time. Wish you a great Memorial Day! As though a souffle wasn't enough, we have to add ice cream, right? ; ) Hope you have a great weekend ahead as well! My husband is a huge fan of pistachio and I just can't wait to try this out. This combo sounds awesome. Wish you a happy memorable day weekend. I recommend either the ice cream or the souffle, together or separate! Hope you have a lovely weekend. Thank you! It brings a smile to my face when I look at it. Thanks, Aimee. Have a nice weekend! I wish I was sitting down to dessert with you! 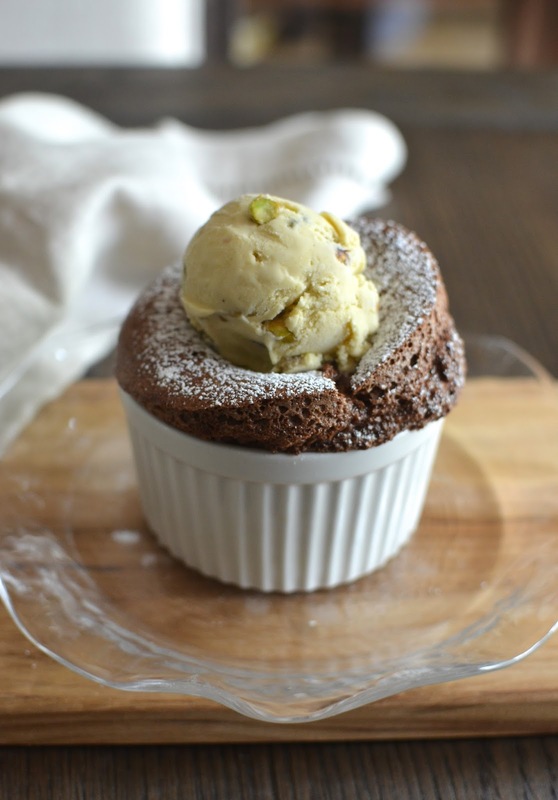 Both the chocolate souffle and pistachio ice cream look sensational. And these two are a match made in heaven. Great work Monica! I keep daydreaming about this one. Thanks, Sonali. Hope all is well!